This is less of a review and more of a story about how I came to learn of the book Neither Wolf Nor Dog, and then my process through attempts to understand its full, often uncomfortable meaning. About this time a year ago I received an invitation, really it was delivered as a demand, from a Lakota elder that I come to South Dakota to receive teachings. It came at a time I was continually traveling, barely home but longing to be. When I thanked him and attempted to arrange a time that made it easier for me, he became insistent. We finally settled on a time. For me, it meant giving up the only travel-free week I’d had in some time. I wasn’t sure what this was all about, and didn’t know the elder. The prior contact we’d had was relatively brief, a long phone call. I finally decided it was something I was being called to do. I would like to say it was a meaningful journey and a great sharing passed between us. Instead, our time ended abruptly. I left with even more confusion than I’d periodically felt over those days and a high level of frustration, angry at myself that I’d been talked into coming. Clearly, there was much he kept tightly wrapped. Although, it sometimes emerged in ways I wasn’t used to dealing with, much less how to respond adequately. But I was going directly to another commitment, one that mattered a lot to me. So I tucked the strong emotions away and chalked the whole thing up to a mystery of the Universe. Before I made that trip to South Dakota, I’d mentioned it to a friend. She said there was a book she thought would be good for me to read. I dutifully ordered Neither Wolf Nor Dog but didn’t have time to read it before I left. It found its place on my bookshelf where it languished. I hadn’t known it was made into a movie. Some months later it was being shown where I live, and I followed the strong urge to see it. The film hadn’t progressed very far when I began to get the eerie feeling of dejá vu. An author from Minnesota, Kent Nerburn, received a cryptic phone call out of the blue from a woman saying her Lakota grandfather wanted to see him. No reason given but delivered with a sense of urgency. Some months later, Nerburn—as he came to be called—finally was able to free up some time to make the long trip to the isolated place the elder Dan called home. There were few explanations given to Nerburn, punctuated with a lot of silences. Quickly, Dan’s younger Lakota friend Grover was introduced into the story, a caustic individual with barely contained anger frequently directed toward Nerburn in clipped tones and looks. Frankly, I wondered why Nerburn stayed around. I think he did, too. He wrestled with his own responses and ultimately decided to let things play out. Plus, he had the nice guy syndrome going. I experienced repeated slaps in the face watching all this. It was visceral. When Dan and Grover threw Nerburn in the car and took off on a little explained, exhaustive trip across the Dakotas, my forearms puckered into chicken skin that didn’t go away until the film ended. There were just too many parallels. The places they went, the flavor of the discourse. Showing rather than telling. When Dan broke silences to hold forth on what he wanted Nerburn to learn of the Lakota people…what he wanted Nerburn to put out there in writing… Well, I don’t have words for what I felt. Clearly, I was not going to be allowed to tuck away my still strong emotions and bewilderment about the journey I took to the Dakotas. I can only believe unseen forces were taking me by the hand to engage with all of it. So I started to read the book. It was not easy going for me. I could only read a few pages at a time. Then I’d have to digest the contents. Most of the things covered in Neither Wolf Nor Dog I knew about in some form: the atrocities done to Native peoples by whites, cultural differences in beliefs and values…and then there’s appropriation of Native traditions by white people searching to find spiritual grounding…or those who seek to do good but hold a hidden agenda. But I hadn’t found anything to the depth or in the frame presented by Dan, and even Grover, in this writing. The book naturally goes much deeper than the movie ever could. It took me over two months to read Neither Wolf Nor Dog. I stepped back numerous times to examine the level of my own assumptions and awareness, as well as my motivations behind the work I’ve devoted twenty years of my life. It was a necessary, intensive process. I can’t say it’s over. Instead, it’s all percolating some place inside. I don’t know what will finally emerge. Neither Wolf Nor Dog is book one of a trilogy that recounts the story of an Indian elder, the surrounding Lakota community, and the white man who somehow has been called to be part of the Truth-naming. The Wolf at Twilight is about Dan’s search for his long-lost sister Yellow Bird who, kidnapped from her home some eighty years before, never returned from the Indian boarding school. The Girl Who Sang to the Buffalo brings back the things many have forgotten: the meaning of dreams, the abilities to engage with nature and speak with animals. Sadly, it uncovers the existence of a secret asylum and events that took place there. Kent Nerburn says these books are fictional accounts of actual events. The truths are in each sentence and have global application. This isn’t merely history. It’s today. The books are available on Amazon or elsewhere. The movie may still be making the rounds in theaters. Hopefully, it will be offered streaming soon. With many thanks to Karen Marchetti who turned me on to Neither Wolf Nor Dog. Without this guidebook I may never integrate the odyssey I was strangely called to undertake. We drove along the South Rim tourist area of the Grand Canyon and wound our way to the west on a dirt road through tall pines. Leaving the throngs of people behind, with much anticipation, we entered a different world. During opening circle for our spiritual travel program to Hopi just the night before, I’d let the folks know an opportunity had presented itself. The Grand Canyon is sacred to the Hopi. They emerged into this middle world in ancient times from a point deep in its interior, and the Havasupai people have called it home for at least a thousand years. A relationship exists between these peoples. So when my Hopi partner Char Joseph contacted the Havasupai Tribe inquiring if there was someone who would speak to us about their ways, they were happy to oblige saying…all too often they were forgotten. We pulled into Supai Camp, once the tribal winter home on the rim where just a few remain. The traditional dwellings are long gone. In 1934 the National Park Service (NPS) tore down or burned the homes without notice to the residents who were away at the time. I Am the Grand Canyon documents more than a century’s devastation of the Havasupai at the hands of the US federal government, NPS, Grand Canyon Association and Sierra Club. In the book, Havasupai Mack Putesoy testified how their homes were burned to the ground with all their belongings inside. Effie Hanna said she lost things she’d been saving all her life. In place of traditional homes on their aboriginal lands, the NPS built cabins and forced the residents to pay rent. However, I knew none of this at the time we approached the home where we’d been invited. Havasupai girl, circa 1900. Photo credit unknown. We were greeted at the door by Colleen Kaska, daughter of Daniel Kaska who was chairman of the Havasupai Tribe in the 1970s. Elder Daniel is now quite frail but welcomed us. He wanted to tell us the story of the Havasupai, People of the Blue-Green Waters named after the beautiful canyon waters running through the area they now mostly live. Colleen shared in the storytelling. Their aboriginal lands once encompassed areas from the Grand Canyon to the Colorado River and the San Francisco Peaks west to Ashfork and Seligman. In the warm months they lived in what is now known as Cataract Canyon in the interior of the Grand Canyon and grew crops. In winter months they dwelt on the rim in order to hunt. Once the Santa Fe railroad came along and interest in the Grand Canyon grew as a tourist and recreational site the Havasupai were squeezed and began to suffer. In 1882 President Arthur declared the majority of their aboriginal land belonged to the American public. The People of the Blue-Green Waters lost their plateau hunting-herding lands and many thousands of acres. They were barred from rim watering holes by cattlemen and the NPS…and relegated to Cataract Canyon. This narrow 518-acre tract doesn’t see sun during winter months, and historically endured flash floods that sometimes took out homes and people. Colleen paused, became still. She had a faraway look in her eyes. “Yes. But when I walk our aboriginal lands⎯the ones taken from us⎯I know it is of my people. My ancestors are there.” The tone of her voice made clear that knowledge gave her strength. Elder Daniel spoke haltingly of the century-long struggles to be recognized by the federal government, to regain any of the land taken from them, including his own personal involvement as chairman in this quest. Finally, in 1976 they succeeded to a small degree: 185 acres returned to the Havasupai with 95,300 acres named “Havasupai Use Lands” but controlled by the NPS. Havasupai Elder Daniel Kaska & Maya Daykeeper Apab’yan Tew. Photo: Colleen Kaska. K’iche’ Maya Daykeeper Apab’yan Tew was present as a sponsored guest on our spiritual travel program. He wanted to know about Havasupai ceremonies. He asked Daniel, “Do you have a story about some time of a spiritual nature you remember?” Daniel shook his head. It seemed the focus for so long had been a fight for acknowledgment, some recognition of their worth, that there was no energy left for anything else. Mike Weddle⎯Kenosis Spirit Keepers board member, Daykeeper and musician⎯visiting from Maryland was able to join our group for just two days. He brought his flute. I invited Mike to offer Daniel and Colleen a prayer song. The music was sweet. When it came to an end, there was silence. Then Daniel began to sing in words and tones that entered every one of us. The energy seemed to shift. When we all expressed how it touched us, he uttered softly, “It’s a funeral song.” And then, “We are a lost tribe.” It was painful to hear of such loss. Our visit was over. We formed a circle outside under the pines and invited Colleen to join us. Elder Daniel was unable to do so. Apab’yan offered a Maya prayer for the People of the Blue-Green Waters and the land. A few days later I received a note from Mike who had to leave for other business. I think we all felt the same as elder Daniel Kaska told his story of loss and betrayal, going to Washington where no one would listen, voting against the government deal when his own people would not listen, and his final ‘I don’t know what will become of us’. When he sang his beautiful song, and then said it was a funeral song, I almost wept. We were invited by Colleen to join a singing ceremony 8 am Saturday at Red Butte. I did go to represent us but there was no one there. There are two forest roads on each side of the Butte, but no people, no cars, and no singing. So I climbed the switchbacks to the very top of the butte, the summit. At the very top there is a crossing with 4 paths going in the 4 cardinal directions. I’m sending a photo. Colleen called this the Supai place of origin. I felt that in just 2 days I had been witness to the place where the Supai began and perhaps the place where they end. As there was no one else there to sing, I did the singing, and I sang the Maltyoxb’al, the [Maya] great gratitude song, for the arc of the Supai nation. Red Butte where the Havasupai were born to this world. Photo: Mike Weddle. Four Directions at the summit of Red Butte. Photo: Mike Weddle. When we held our closing circle at the end of our week with the Hopi and Havasupai people, I spoke to the group. I never know in advance how things will unfold when we hold a sacred container of pure intent. Things I can never predict come in ways that affect us all. I believe the most important thing we did during this journey was sit in respect, listen deeply to this Elder’s words and witness the grief he carries. Sometimes that’s all we can do even in the face of our own helplessness at such recognition. And that acknowledgment matters. Note: Elder Daniel Kaska singing recorded by Apab’yan Tew. Go here to learn more about Spiritual Travel to Hopi: Sacred Guardians of the World, and check back for next year’s March travels. I will tell you up front that this is a difficult film to watch and can bring up all kinds of emotion. But if you’re going to watch it, then do so until the end because toward its finish there is much hope conveyed. During our recent Spirit Keepers Series held in Phoenix on the subject of PTSD and Native healing ways, I had invited Eli PaintedCrow, an Iraq War veteran of the Yaqui Nation and co-founder of Turtle Women Rising, to take part based on her own experiences and to frame further aspects of our Series. She showed a portion of Wellbriety Journey to Forgiveness, a documentary produced by White Bison, Inc. They’re a Native American-operated 501(c)3 nonprofit dedicated to culturally-based healing for Indigenous peoples. The film starts out with a prophecy given by the Old Ones about the light skins who would arrive, create confusion and great destruction. How everything would be taken from the Native American but their spirituality. There would be tremendous suffering, genocide and a time of testing. But opportunity for healing would present itself. After this time of healing, the buffalo, Native people and all manner of sustenance would return. Harmony would prevail. Native people believe that we entered this time of healing in the early 1990s. This is the story of that destruction, particularly centered on boarding schools and their effect. If you’re not familiar, in 1879 the first Indian boarding school was opened in New Carlisle, PA. Native children were forcibly taken from their families and shipped off to such schools around the US where they were stripped of their language and anything having to do with their culture. They endured ongoing violence and humiliation in silence—many didn’t survive—and it had horribly detrimental effects reaching all the way to today. This is called intergenerational trauma, certainly a form of PTSD. As a part of the Wellbriety Movement, Native organizers undertook a 7000-mile journey all over the US to give Elders and their children a chance to tell their stories, perhaps for the first time, and express grief. In this undertaking they hoped to break the cycle of addiction and violence, begin the road to forgiveness and a return to spiritual traditions. The film covers Native values and how to live in harmony as taught by the Old Ones, along with a model called the Four Directions of Forgiveness and a call to Greater Purpose. This is an extremely powerful film and could be called the Schindler’s List for Native Americans. It was created as an Indian Give-Away by White Bison for purposes of truth-telling and healing. Whether you have Indigenous members in your family line who suffered the atrocities, have ancestors who perpetrated any part of it, or are born of mixed blood as many of us are…the message presented here is relevant to all. The effects of genocide, abuse and shame are equally carried through the family line. This is a film for anyone whose ancestors have experienced anything of the like. That doesn’t leave out many people on the planet. This is a move for truth—no more secrets—and healing accomplished when we live in harmony as the Old Ones taught. Seeing the complete film instilled even more significance to me in how I personally live and greater understanding of the important work Kenosis Spirit Keepers does, even if we reach only a few. This is a film for the Next Seven Generations. Critical mass is important. View the film for free on You Tube and share widely. Length: 1 hour, 13 minutes. Also visit White Bison to learn of their healing institution and classes. I’ve seen the Dakota 38 documentary three times now. Each time it’s stirred something in me that has no words, but much emotion. This film is about the Dakota Wokiksuye Memorial Ride first undertaken December 10-26, 2008 and held at the same time each year since. In 2005 a dream vision came to Jim Miller, a Dakota Vietnam Veteran—one so terrible that he tried to forget it. He said you have a sense when something was real and “it wouldn’t go away.” What he saw was a dark occurrence in the name of justice, largely hidden in history and unknown to Jim at the time. On December 26, 1862 at 10 a.m. in Mankato, Minnesota, 38 Sioux warriors were hung in the public square, the largest mass execution in the history of the US. President Abraham Lincoln ordered it so on December 6. Two more warriors were executed the following year. In the opening lines of the film, Jim Miller talks about what it means to be Dakota—”to walk in harmony with every living thing.” Feeling directed by the Creator, he organized a ride on horseback over 330 miles, leaving on December 10, 2008 from Lower Brule, South Dakota to arrive for ceremony at the hanging site in Mankato on December 26. The Memorial Ride was meant to honor the ancestors and as resolution …forgiveness. This was not an easy undertaking. There were blizzard conditions to be endured. Participants faced conflicting emotions related to racism, something openly discussed. There were many poignant moments when the riders disclosed why they were riding: for ancestors, family, to lay something to rest within themselves. Communities along the way heard about their mission and helped out, unbidden, by providing food and shelter for the riders and their horses, especially in extreme weather. The film lends hope, portraying people pulling together—even in emotional discomfort—attempting to heal and overcome horrible tragedies that never should have happened. We need so much more of this today. And such things kept in the dark must be known. View the full-length film free on You Tube. Length: 1 hour, 18 minutes. Follow the public posts on Facebook and see day-to-day photos and videos of this year’s ride. Please join me in supporting the Dakota 38 + 2 Memorial Ride with funds going to provide food for riders and horses, plus gas for support vehicles. Donations go through their 501(c)3 fiscal agent, the American Indian Institute. Send checks (with “Dakota 38 ride” in the memo line) to: Eric Noyes, Executive Director, American Indian Institute, 502 W. Mendenhall Street, Bozeman, MT 59715. To donate online, go here and scroll down to click on Dakota 38. *Further research beyond the documentary showed the trials to be a farce, each one lasting about 15 minutes. In the end 303 were slated for execution, which President Lincoln reduced to 38. Co-Opting the Memory of the Dakota 38 + 2. In the late 1980s after my return to Ohio, I took oil painting classes for a couple of years from Chief Hawk Pope of the Shawnee Nation United Remnant Band. I valued his sheer presence and laser-like critiques. He was direct, something I appreciated. I was there to learn, not to have my ego soothed. When something worked, he pointed it out. When it didn’t, he showed how it didn’t and guided correction—explicitly. I’ve learned that his methods are part of his personality, the make-up of a strong chief, not asking any more of his People than he demands of himself. But that understanding wasn’t even on my horizon when I knew him back then. My interest and passion for preservation of Native ways was yet bubbling beneath the surface, not to fully emerge until the mid-1990s. By that time we had fallen out of touch for some years. In the first months of 2014, he began to cross my mind periodically. These occurrences were fleeting; I didn’t hang onto them or wonder why. In early April I went to Ohio to visit my folks, still living near Dayton. As soon as I arrived I had an overwhelming compulsion to find Chief Hawk—if I could—and reconnect. I googled his name and discovered his life had taken quite a turn in the 1990s and later. He’d provided vocals for one of the scenes in the movie Dances with Wolves and been extensively involved with the PBS documentary mini-series 500 Nations. In the book Imagining Native America in Music author Michael V Pisani wrote of the musical language he used in the documentary: …the singer Chief Hawk Pope relied on this melodic cadence to underscore moments of great sadness and tragedy such as the Trail of Tears sequence. I also noted he’d been on tour with Spirit the Seventh Fire, a multi-media production conceived by his friend Peter Buffet, with music written by them both. And the Shawnee Nation United Remnant Band now had a home on original Shawnee land, previously lost as a result of genocide advocated through the Indian Removal Act, purchased back by the Tribe. I found contact information for the Tribe through their Facebook page and sent a private message explaining who I am and that I’d like to reconnect if Chief Hawk was interested. I got an immediate response from one of the Tribe asking me to come to the Zane Shawnee Caverns, on Shawnee land, a few days later for a meeting. Prior to the appointed day, my mom and I ventured out for a day of sightseeing and got hopelessly lost in an area of Ohio unfamiliar to us both. We ended up in the tiny town of Zanesfield looking for a museum we were told was at least 100 miles north. A few days later on the way to my meeting with Chief Hawk, I was astounded to end up in the very area my mom and I got lost, indeed going right through Zanesfield and drove just a few miles beyond! I really had no idea why I received inner direction to initiate the request I did. I merely followed that strong, not-to-be-disregarded energy. When I walked into the Zane Shawnee gift shop for our reunion, it was evident that I was supposed to be there. The reconnection was powerful for us both. Beyond that day, I returned to spend another in deep conversation prior to my departure on other travels east. We agreed we’re going to work together—although neither of us know exactly what that means at this point. Before I left I told Chief Hawk about my unprovoked thoughts of him coming to mind the months prior…then the inner urge to initiate a reunion…even getting lost in the countryside near Shawnee land…when I had no idea they were there. I’m glad I paid attention and answered. Below is an open article written in 1998 to his People in Tosãn Shawandasse, the official voice of the Shawnee Nation United Remnant Band, beautifully illustrating elements of intent and belief. * What Chief Hawk doesn’t expressly share is the tremendous sacrifice he has borne through his 40+ years as chief since taking on this spiritual responsibility as a young man, given to him by his grandfather. While directed to the Shawnee People, any of us can take heart and guidance here. His words are truth. – Believing you can meet that need even if that only seems to be a dream. – The courage to go for it, knowing you could lose. – Work as hard as it takes to make it happen. – Get as many of the People as you can to make a team that can do the job. – Do all you possibly can, knowing that if you truly do that, Creator will take up where your abilities leave off. – Convey your hopes, dreams, and needs along with your love and respect to Creator and demonstrate that you are still His Children (The Shawnee). This you do in the way He left for us, the ceremonies. – Rise above the criticisms and stumbling blocks thrown in your way by the petty, evil or just those much smaller than the dream. You can’t let their fear become yours, their criticism or lack of support shake your faith, or their jealousy pull you down. – Stay the course, no matter what. 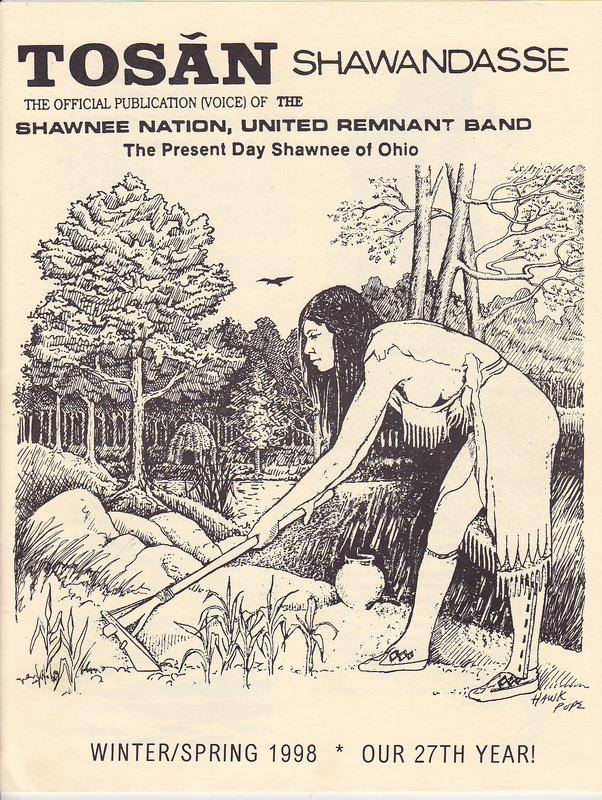 — 1970: Reorganization of the people of the Remnant communities and reformation of the Shawnee Nation, United Remnant Band. — 1974: Formed an interim core Council and moved back to Ohio homeland. — 1980: Gained State recognition as the descendant Tribe of the historic Shawnee in Ohio. — 1982: Brought back the ancient ceremonies after 30 years. — 1985: Constructed our first Great House since historic Lower Shawnee Town on the Scioto. — 1989: Purchased the first 31 acres of Ohio Shawnee Homeland-Shawandasse. — 1992: Built the community center, road, electric and well on Shawandasse. The Great House was moved to Shawandasse and original dress brought back to ceremonies. — 1995: Total of 228 acres in 3 Ohio counties. You are invited by Chief Hawk Pope to visit Shawnee lands located at Zane Shawnee Caverns near Bellefontaine, Ohio. See their website for information on Pow Wows, camping, cave visits and other events and developments on Shawnee lands since 1995. * Reprinting of this open article was used with full permission granted by Chief Hawk Pope. There are two roles: the Israeli Prime Minister or the Palestinian President. You can even take both sides and play “against” yourself, entering into different worldviews and available resources. Crisis situations inspired by real events are presented for a decision. There are political advisors who try to persuade to their side—hawk or dove. So it’s about decision-making and strategies. But the most interesting thing is that it shows the effect of the decision—and how the impact of that one critical act may play out in the future! Not unlike a process I often take clients through when they’re at some important juncture in their lives. They did a short demo during the interview. The host chose to play the Israeli Prime Minister. A skirmish popped up. The advisors hovered. What to do? After a bit of indecision, the host decided he’d send in the army in the name of security—the hawk’s advice. It worked…for a moment. Almost immediately red lights lit up in a number of places on the map. His decision had sparked other crises! Then he was presented with the dire conditions Palestinian civilians were suffering as a result of his decision. What to do? He took the dove’s advice this time and sent aid. But wait. The Palestinians rejected it. They didn’t trust the move. Look what he did just a short time ago. And so it goes…you don’t win in this game, or any other for that matter, unless the outcome is balanced for both sides. The inventor said losing and frustration are part of the lesson. We have to learn to do it differently—for all concerned—until competition becomes moot. A one-sided gain never works in the long run. It’s really about acquiring far vision, following a decision out to the horizon line as much as we can. 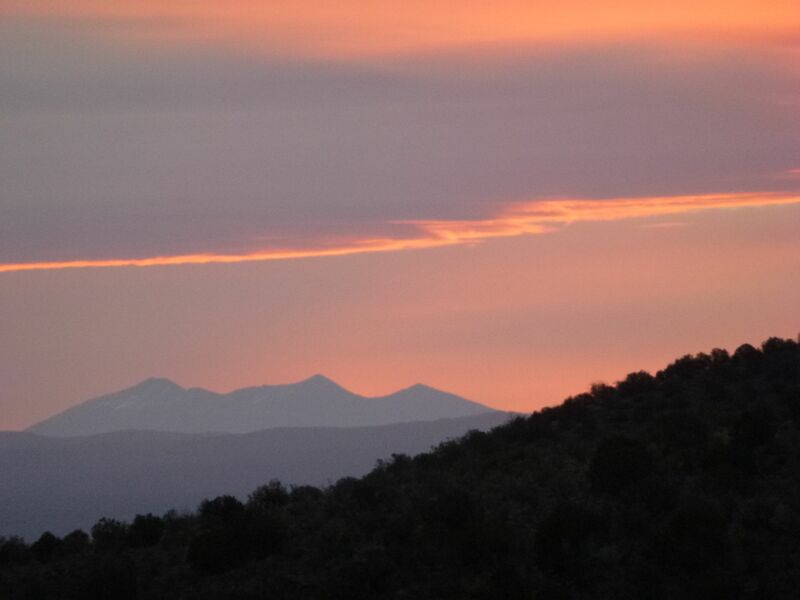 San Francisco Peaks sacred to the Native people of Arizona. This view from my own sanctuary inspires me to maintain the far vision every day. 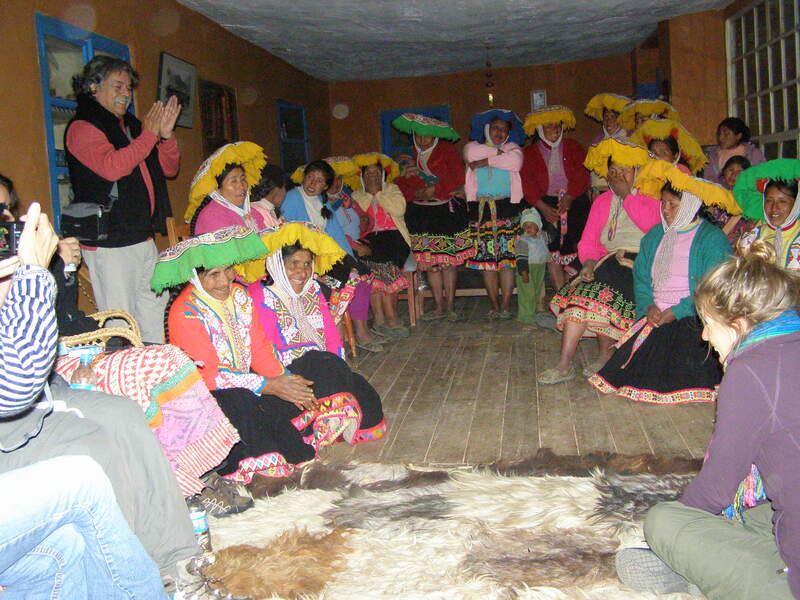 In 2009 I was in Santa Fe at a conference put on by the International Funders for Indigenous Peoples Foundation. 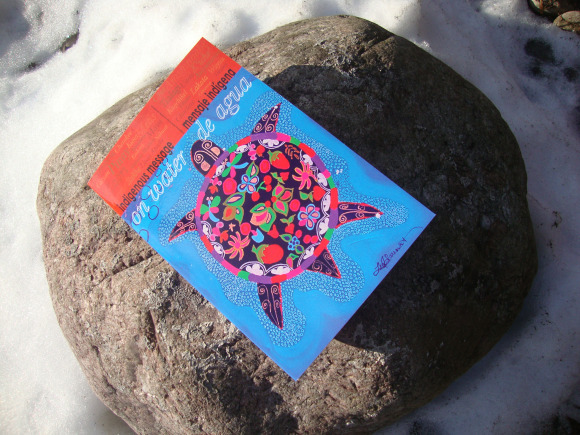 I heard many stories about outside impacts endangering Native lifeways. A Zuni farmer from Northern Arizona talked about the challenge he was having keeping genetically engineered corn from blowing into his fields and pollinating his Native corn. The result would be stalks that grow higher but are broken by the wind—and the loss of their pure Native strain that had adapted well to the conditions of their land over centuries. For his people it’s not just about loss of crops and food but also loss of heritage, a spiritual connection. Shortly after returning I saw the documentary The Future of Food, largely about genetically engineered food and its effect, not only on health but heritage, and the absurd greed of large corporations. You see, these corporations have been allowed to patent their seed, a strange practice. There was a story about a farmer in the Midwest who, much like the Zuni farmer, was having trouble with Monsanto Corporation trucks passing on the highway blowing their corn into his fields. His family had developed their heritage corn over a couple of hundred years. He lost the battle. Not only did Monsanto’s corn cross-pollinate, he lost his family heritage in more ways than one. In a bizarre move, Monsanto sued him for patent infringement and won. Had such an outcome crossed the minds of scientists in the Monsanto labs who were developing the product? I’d like to give them the benefit of the doubt but who knows. Since that film came out there have been a number of others with a similar story line. The examples given here—warring countries, loss of traditions and ways of life—are very big issues. But we can have an impact at the micro level, every day in our own lives, that play into the macro level. Typically we’re untrained. Not many think of wider impact, through time. But if we take the opportunity to project our thoughts and potential actions on down the road and assess the likely outcome, we’d actually find we all have an innate sense of far vision. We just need to stop, take a breath and then use it. If you need it, perhaps you can find further inspiration from Neil Young. I’m issuing you an invitation to make a statement for far vision. Participate in our January 31-February 1 Seed Wisdom events in Phoenix. Proceeds benefit the seed saving project founded by Grandmother Flordemayo of the International Council of 13 Indigenous Grandmothers. Make an impact. If you’re unable to attend, please donate to the project. Every bit makes a difference.